Rice in Spain, in particular in Valencia, has a history of at least eleven centuries. Rice-growing in Valencia’s Albufera region dates back to the 10th century, when Arabs introduced rice to the Iberian Peninsula and other surrounding areas such as Morocco and Sicily. In fact, the Spanish name for rice, arroz, derives from the Persian orz, to which the Arabs prefixed the particle al, eventually leading to a language evolution from al-orz to ar-orz, to ar-ruz, and finally to arroz. It is no wonder then, that we can find many rice dishes in the autonomous community of Valencia today. One of these is arroz al horno, in Valencian arròs al forn, a rice dish baked in an oven, made with leftover foods. It is a dish baked and served in a cazuela de barro (a kind of clay pot), with ingredients such as chickpeas, tomatoes, garlic, potatoes, and various pork products (pork ribs, morcilla sausages, etc.) – a great tribute to the more humble parts of a pig. Due to its oven-cooking method in a special clay pot, the arroz al horno dish is a pleasantly crisp and crunchy rice. To achieve this dry rather than brothy effect, the gap between the top of the oven and the rice should be minimal when cooking. The Spanish Bomba rice variety also particularly lends itself to this dish, since its grains remain separate and do not stick together. Arroz al horno in its current form has a history of at least a few centuries – rice baked in a clay pot was first documented in the 16th century. At that point ingredients originating from the Americas such as the tomato and potato, which are still commonly used today, would have had enough time to be considered as being included in the dish. As you may well be aware of, baking bread was until relatively recently linked to communal or neighbourhood ovens, and the same applied to rice as well. For a small fee, the women of the household would carry the rice in their hands to one of the large neighbourhood ovens and cook it there. This had the added appeal of catching up with neighbours and friends in the process, and is why baked rice is also known as d’arròs passejat in Catalan, literally meaning rice that went for a stroll. Much like many working women today, a housewife during those times was faced with so many daily time-consuming tasks, that a one-pot dish was often the most sensical and time-saving thing to prepare. Arroz al horno, in particular, had the added advantage of not losing its sapid taste even if served hours after it was made, thus making it both a relatively quick and flexible dish – and frugal too, given that it was made of leftovers. Together with paella and arroz a banda (a dish of rice cooked in fish stock), it is one of the most popular rice dishes in the culinary haven of Valencia today (Valencians have developed many prized foods and drinks, such as the nutty and refreshing horchata). There is even a national arroz al horno competition held every year in the town of Xàtiva. Food critic Lluis Ruiz Soler from Alicante has even come up with the hypothesis that the infamous paella is a development of the oven-baked rice dish arroz al horno. While rice baked in a clay pot was first documented in the 16th century, paella was mentioned for the first time in written accounts in the 18th century. 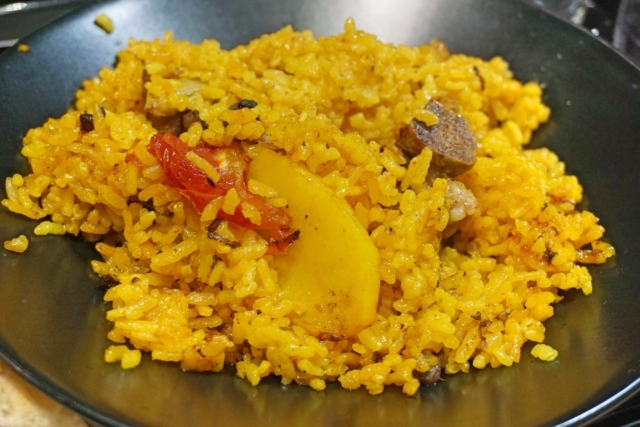 But unlike the internationally known paella, which can be found in many restaurants as a large dish to be shared, arroz al horno is a meal more commonly enjoyed at home, or in casual eating establishments such as at the panadería (bakery) Panea, where locals will come for breakfast or lunch. Having missed the opportunity to try out the dish at a restaurant recommended by our Airbnb hosts, I immediately felt drawn to the sign announcing arroz al horno as one of the platos del día (dishes of the day) as I passed this local bakery. It was an incredibly affordable lunch at €3,95, but none the less delicious for it. What a satisfying meal to have in lieu of the usual sandwich lunch, pleasantly soft with a bit of an added crunch, and so packed full of flavour. 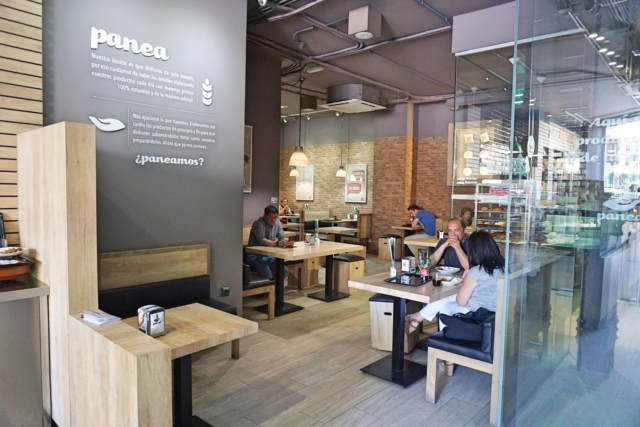 Dishes like arroz al horno served in such a casual place as a bakery barely get written about. But it’s those little contemporary food customs that seem most fascinating and enviable to me, where a dish that developed over centuries can be enjoyed over an ordinary lunch for an affordable price. It’s so normal, that there’s nothing special to it – or so one would think. But when it’s something that virtually doesn’t exist in other parts of the world, that is so fulfilling and yet completely unrecognized internationally, perhaps little talked about locally for the simple fact of just being there, then it becomes something pretty special that I feel obliged and excited to share. In my research I came across this recipe, but since it is one that I have not yet tried and am thus unsure of what the result would be, I hope that you will get the opportunity to try arroz al horno in Valencia one day.